The first thing came in mind when people thought about Sarawak its capital city, Kuching. But do you know that Miri is the second largest city in Sarawak and there are plenty of places to visit as well? You will be surprise when you really visit these places, it’s beautiful and amazing! If you enjoy sea breeze, perhaps you would like to visit Tusan Beach, Marina Bay or Brighton Beach (Tanjung Lobang). Tusan Beach is famous for it’s “blue tears” phenomenon which occurs when micro-organisms live in the water are interrupted by oxygen to produce a bright blue light on the beach. And another attraction is the cliffs of Tanjung Layang-layang which is also known as “Horse Stone”. Why is it named like this? It is believe that the rock formation resembles a horse drinking the water. Marina Bay is famous for its sea horse’s light house. It’s also a nice to relax and enjoy the sea breeze, you can even spot Tanjung Lobang there. A lot of visitors and also locals choose to visit Tanjung Lobang or named as Brington Beach too as they can enjoy the sunset moments together with their love ones. It’s also popular for its food there as visitors can find a lot of stalls selling different kind of seafood, and this section is called as “Taman Selera”. There are also few breath taking places in Miri where you can breathe in fresh air, places like Niah National Park, Gunung Mulu National Park, Borneo Tropical Rainforest Miri, Lambir Hills National Park and Canada Hill. Niah National Park is famous for the many limestone caves in which people used to live and also its swiftlet nests which are very expensive. The caves within this park can be visited without a tour guide beside you. Gunung Mulu National Park is one of the place in World Heritage list. It’s best known for its gigantic cave system. The largest cave chamber in the world is here in Gunung Mulu National Park which is known as Sarawak Chamber. It is also the longest cave in Southeast Asia. You can find a unique collection of jungle species and insects which can only be found in Borneo Tropical Rainforest. You can spend your weekends hiking here and enjoy fresh air. The main attraction of Lambir Hills National Park will be it’s waterfalls. The Latak Waterfall is very beautiful place to visit. Don’t mistakenly think that Canada Hill is in Canada kay? Is a place in Miri where first oil well was drilled. It’s famous attraction is the Old Grand Lady, but definitely not an old woman statue or something, is actually the Miri Well N. 1 which is the iconic derrick structure of Miri where first oil well was used to struck oil for the first time on December 1910. 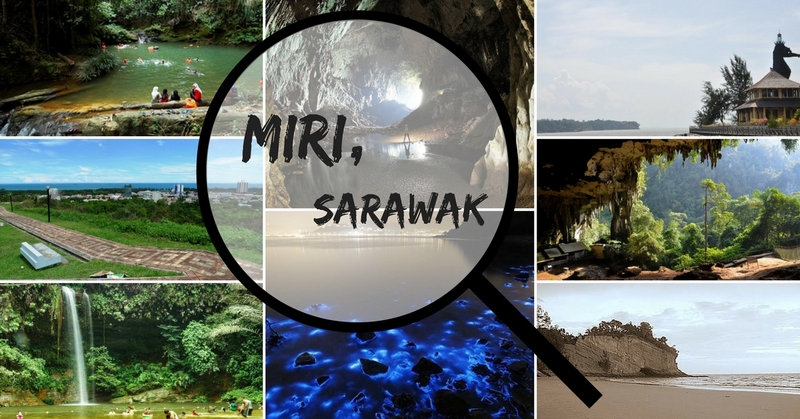 NOW, do you feel like going to Miri, Sarawak and have a look? I bet you want to because I want to too.